3/25/2009Share this story on Facebook! “Water Theory” is a collection of three installations designed by Megan Roberts, a composer and media artist, and Raymond Ghirardo, a sculptor and media artist. 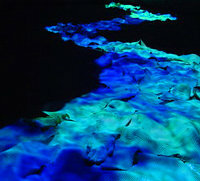 The exhibit uses unusual materials such as neon, latex, and salt to illustrate water’s movement and significance in people’s lives. “It’s about water as a source of many facets of our lives, not only for the biological but for the aesthetic as well,” said Tanya Saunders, dean of the Division of Interdisciplinary and International Studies, in an interview with IC's student newspaper, the Ithacan. And it’s very, very cool. The exhibit is cosponsored by the Park Foundation and the Finger Lakes Environmental Film Festival. Next month, artist Spencer Finch comes to campus to transform IC’s Center for Natural Sciences into a center for art as part of the 2009 C.P. Snow Lecture Series. Finch’s work is innovative in the way it bridges art and science, like conceptualizing the color purple that only bees see.